This is an Open Edition Print by the artist Audrey Tarrant.445mm x 535mmBank Holiday on th.. This is an Open Edition Print by the artist Audrey Tarrant.444mm x 533mmMarket DayPubl.. This is an Open Edition Print by the artist Audrey Tarrant.444mm x 533mmThe AerodromeP.. This is an Open Edition Print by the artist Audrey Tarrant.444mm x 527mmThe Railway Statio.. This is an Open Edition Print by the artist Audrey Tarrant.445mm x 535mmThe Tow PathPu.. This is an Open Edition Print by the artist Margaret Tarrant.406mm x 298mmAnticipation.. This is an Open Edition Print by the artist Margaret Tarrant.406mm x 318mmDo You Believe i..
Margaret Tarrant - Here We Go! This is an Open Edition Print by the artist Margaret Tarrant.183mm x 257mmHere We Go!P.. This is an Open Edition Print by the artist Margaret Tarrant.289mm x 406mmLesson TimeP.. This is an Open Edition Print by the artist Margaret Tarrant.160mm x 280mmLooking Glass El.. This is an Open Edition Print by the artist Margaret Tarrant.406mm x 283mmPeter's Friend .. This is an Open Edition Print by the artist Margaret Tarrant.406mm x 325mmSlippery Slopes .. This is an Open Edition Print by the artist Margaret Tarrant.460mm x 380mmSpring Butterfly.. This is an Open Edition Print by the artist Margaret Tarrant.406mm x 298mmThe Boat to Fair.. This is an Open Edition Print by the artist Margaret Tarrant.230mm x 230mmThe DancePub.. 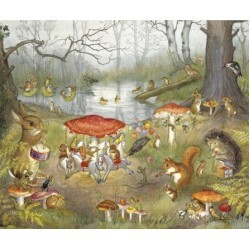 This is an Open Edition Print by the artist Margaret Tarrant.330mm x 254mmThe Fairy Troupe.. This is an Open Edition Print by the artist Margaret Tarrant.406mm x 308mmThe Proposal.. This is an Open Edition Print by the artist Margaret Tarrant.406mm x 305mmThe Water Lily P.. This is an Open Edition Print by the artist Margaret Tarrant.406mm x 314mmTwilight Process.. This is an Open Edition Print by the artist Margaret Tarrant.444mm x 533mmWandering Minstr..